Out of the 39 million blind people around the world, only 10% know how to read/write in braille. Even those who know braille cannot understand shapes of many objects around them. Through Fittle, we are trying to make visually challenged children learn braille letters, spellings of words, and shapes/forms of the objects that these words represent—all at the same time, engaging them through a puzzle. 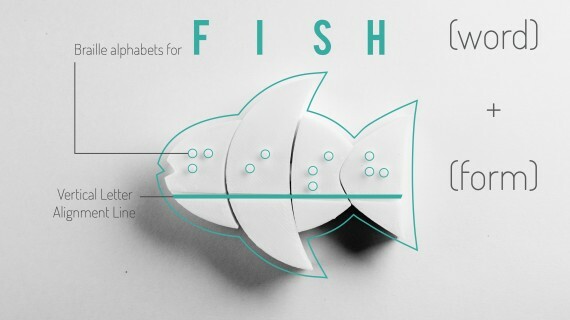 The word “fish” is constructed by joining together 4 puzzle blocks that have braille letters F-I-S-H embossed on them. The blind child fits together the blocks by feeling and matching the right shapes. A line engraved at its bottom ensures that the letters are aligned. The kid is able to read the word “fish”. Next, the kid feels around the contours of the entire bloc, to understand what the form of a fish is. The playful interaction involved in putting together word blocks helps get blind kids interested in learning braille at a young age. At the same time, feeling around the entire puzzle bock helps the kids understand the shape of the object. This empowers them to visualize what the object might look like, and hence enables them to perceive the world better. People with low or no vision perceive the world through sense of touch, sound, and smell. We interacted with visually challenged people to understand how they perceive form, and tried to build upon their experience. According to studies, early or congenitally blind individuals have stronger cross modal connections the earlier they begin learning braille. An earlier start allows for stronger connections to form, as blind children have to grow up using their sense of touch to read, instead of using their sight. Immersing visually challenged kids through playful interaction, Fittle makes current academic learning multi-sensorial and cross-modal, and hence, much more effective than existing methods. A parent, teacher, or guardian can initially guide the child about the basic rules of the puzzle, and then, the kid can keep playing with different puzzles to discover new words and objects. We have seen a lot of excitement for Fittle among teachers and parents of visually challenged kids, who want to use this tool for wholesome teaching of spelling and form. Fittle has been user tested with 8 visually challenged kids at two blind schools—Devnar School for the Blind, Hyderabad, and School for the Blind, Gandhinagar. The kids instantly took a liking to Fittle for the playfulness of the puzzle. Watching them read out the spelling of the word, and then understand the form they are holding in their hands, shows how Fittle gives blind children the happiness of having the power to visualize the world. Teachers were as impressed as the children. We already have many educators and schools asking us how to get their hands on the first Fittle set—26 object puzzles for words starting with each letter of English. E.g. A for Axe, B for Bell, etc. This set is being designed in collaboration with braille educators from LVP Eye Institute. The simplicity and impact of Fittle have been very well received by global entities like TED, Good, The Times of India, Grazia, MakerBot, and Ramesh Raskar; and supported by initiatives like 3D HUBS, as well as eye care experts like Orbis, Aravinda Eye Hospital, and LVP Eye Institute. The project is Open Source, so that anyone can 3D Print Fittle for their child/student/friend. 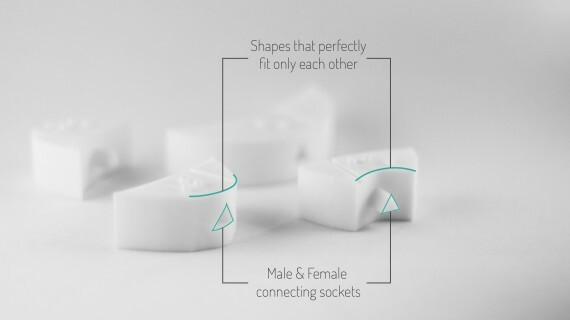 Connectors are made out of basic geometrical shapes that are easily identifiable by young kids, and strengthen perception by touch. Braille dots are kept bigger in size than standard size braille, since these kids have just learnt alphabets, but small enough for an alphabet to fit within their finger at one time.